Construction Worker Skills Register — Danielle Townsend Design Graphic Design and Brand Identity Design Dublin, Danielle Townsend Design is a Graphic Design and Visual Thinking agency based in Dublin. 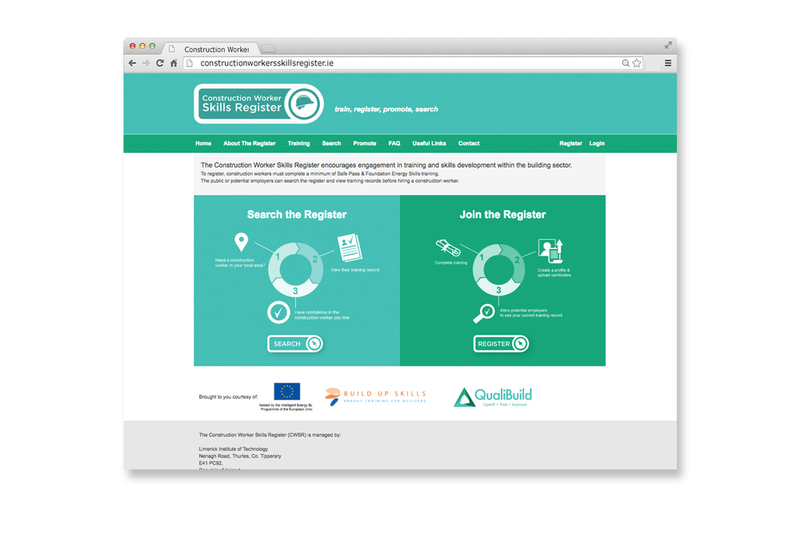 The Construction Worker Skills Register encourages engagement in training and skills development within the building sector. To register, construction workers must complete a minimum level of courses. The public or potential employers can search the register and view training records before hiring a construction worker. The brand is attempting to bring transparency to the building sector and act as a stamp of recognition to those who engage in training. The two stakeholders for the brand are the construction worker and those who are looking to employ a construction worker (the public/employer). Each year the employer can apply for a new registration logo for use on their livery, stationery & promotional materials. The site index page was also designed to maintain consistency across the branding. To create a brand that represent workers in the construction industry and acts as a marque that shows a willingness of the worker to up skill and train. The project was completed in collaboration with Dublin Institute of Technology (DIT), Limerick Institute of Technology (LIT), the QualiBuild project, Build Up Skills & the European Union.